‘Emptiness is form. Form is emptiness.’ A classic verse from the Heart Sutra. Sounds contradicting yet intriguingly true at the same time. Being a beginner learner of the Buddha’s teachings, this doesn’t sound logical to me. The Heart Sutra is the core essence of the Prajna Paramita (Perfection of Wisdom) Though it is the shortest sutra, it is also the most profound sutra. With layman intelligence, it is quite difficult to understand the real meaning behind the verses. If you read the whole sutra literally, at the end of the reading, you might only conclude that everything is empty. There is no feeling, no perception, no volition, no consciousness, no eye, no ear, no tongue etc. Thus some people have a misconception that Buddhism teaches people to do nothing. Sorry, but this is WRONG. If doing nothing can attain Buddhahood, then why are you and I still here? Emptiness is not nothingness, but being empty of any unchanging fixed nature. The Heart Sutra is more than just about emptiness. Every verse has a deeper meaning behind it. It contains the teachings of 4 Noble Truths, Noble Eightfold Path, 12 Links of Dependent Origination… All these are teachings from Sakyamuni Buddha, meant to help all sentient beings to end their suffering… If you are keen to explore the ‘mystical’ teachings in the Heart Sutra and to have a deeper understanding behind every verse that you chant, I will recommend this course to you – ‘The Heart of the Heart Sutra’ by Shen Shi’an. Through this course, you will get to understand the meaning behind every single word and verse. On top of that, you will get to know the origin of Heart Sutra. 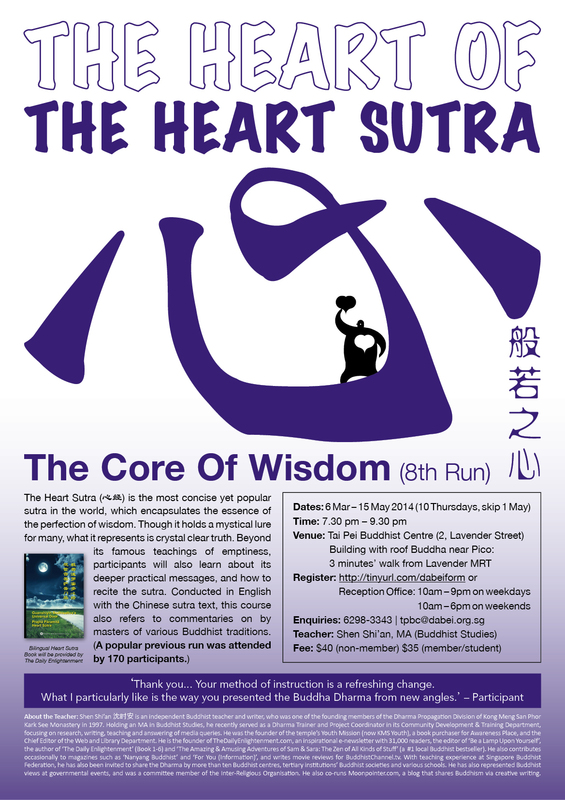 You will also gain insights with different perspectives of the Heart Sutra. Teacher Shi‘an will also skilfully add in some jokes to lighten the mood so as to make sure we will not fall asleep! An independent Buddhist teacher, author, translator and editor, he was one of the founding members of the Dharma Propagation Division of Kong Meng San Phor Kark See Monastery (Bright Hill Temple in Singapore) in 1997. Holding an MA in Buddhist Studies, which covered the major Buddhist traditions, he served as a Dharma Trainer and Project Coordinator in its Community Development & Training Department until 2011, focusing on Buddhist research, writing, teaching and answering of Buddhist queries for the press. He was the founder of the temple’s Youth Mission (now ‘KMS Youth’), a book purchaser for its Awareness Place project, and the Chief Editor of the Web (and Library) Department, which co-supported Buddhanet.net, a popular Buddhist education website. He is the founder and editor of TheDailyEnlightenment.com since 1997, one of the world’s largest independent Buddhist inspirational e-newsletters with over 29,900 members, the editor of ‘Be a Lamp Upon Yourself’, ‘The Stonepeace Book (Volume 1-2)’, ‘Awaken: Gateway to Buddhism (CD-ROM)’ and the writer-editor of ‘The Daily Enlightenment: Reflections for Practising Buddhists (Book 1-6)’ and ‘The Amazing & Amusing Adventures of Sam & Sara: The Zen of All Kinds of Stuff! (which became #1 Buddhist bestseller at Singapore’s largest bookshop).’ Along with translated sutras, he has to date, 11 published works. He also translates sutras and commentaries, and contributes occasionally to magazines such as ‘Nanyang Buddhist’, ‘Awaken’ (for which he was a Contributing Editor), ‘For You (Information)’, and ‘Eastern Horizon’. He served with the film selection team of a Buddhist film festival, writes movie reviews for BuddhistChannel.tv, the world’s leading Buddhist news network, and popularised Dharma@Cinema, an innovative way of sharing the Dharma through detailed reviews and discussions of both popular and offbeat films. Specialising in the Pure Land teachings, he has taught the subject at Singapore Buddhist Federation, Kong Meng San, Pu Ji Si Buddhist Research Centre and Poh Ming Tse, while leading an ongoing weekly Pureland Practice Fellowship. He is also frequently invited to conduct Dharma discussions for youths of tertiary institutions’ Buddhist societies (NUSBS, NTUBS, SIMBB, NYPBS, NPBS) on various subjects, and to introduce Buddhist life perspectives at Secondary Schools (St. Patrick’s School, Manjusri School), Junior Colleges (Catholic Junior College) and International Schools (UWCSEA, SJII). He was also invited to share on Buddhism by Dharma Drum Mountain (Singapore), Fo Guang Shan (Singapore), Tai Pei Buddhist Centre, Singapore Buddhist Mission Youth, Singapore Buddhist Youth Mission, Wat Ananda Youth, Buddha of Medicine Welfare Society, The Buddhist Union, Buddhist Fellowship (Singapore) and Kampung Senang. He has also been invited to Indonesia and Malaysia to teach. He was a committee member of the Inter-Religious Organisation, through which he served in interfaith harmony projects by writing and giving of public talks. He has represented Buddhist points of view at governmental events conducted by NACLI, NHB, NHG, SAF, SPF, MHA, ACM, SPM, STB, OnePeople.sg, IRCC and MCYS. He also co-runs Moonpointer.com, a community blog that promotes creative sharing of Buddhism via thousands of articles. He can be reached at tde [@] thedailyenlightenment.com for invitations to share the Dharma.